When it comes to learning to count, and improving coordination and memory skills, making it fun and engaging can really help a child to develop more quickly and with a greater level of confidence. 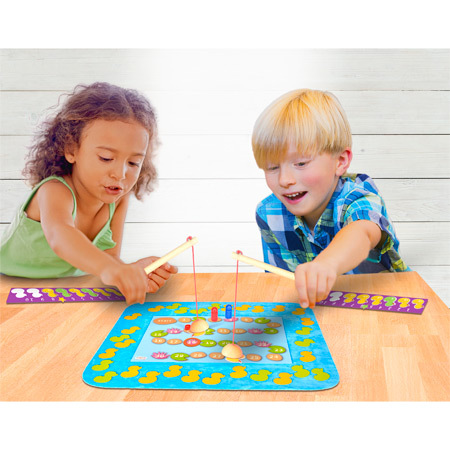 The Fish and Count game with 'Magical' sticky rods has been designed to do just that  its a game with an educational message at its heart that will have children learning to count while immersed in the world of play. Players use fishing rods to fish ducks out of a pond, adding numbers on yellow ducks and subtracting numbers on green ones in order to be the first one to reach their target number. A truly fun and interactive way to encourage counting and numerical development. To make it much more fun and exciting, theres peril in this adding adventure  crocodiles are lurking in the waters and will do all they can to stop players reaching the end. Get caught and youre back to the start! With varying levels of difficulty, this game is great for children who are new to counting or looking to improve on what theyve already learnt. 'Magical' glue-free pads mean theres no glue and no residue, while a simple wipe with a damp cloth will restore stickiness when needed. Fish N Count race comes complete with fabric playing pond, lily pad game board, 2 counting boards, 2 wooden fishing rods with magical glue-free sticky pick-up pads, 36 counting ducks and crocodiles, a target ring, 4 games marker stars, 2 playing tokens and an instruction sheet.